The iSymphony 24-inch 1080p LCD Television allows you to enjoy TV programs with uncompromising picture quality and performance. This is part of the decor SERIES and is designed to fit your lifestyle. The 23.6-inch widescreen active matrix TFT screen delivers high brightness providing a vivid and brilliant picture and high contrast for deeper blacks and brighter whites. 1920 x 1080 native resolution supports Full-HD (1080p) performance. HDMI input enable true digital connection with external high definition signal source. The VGA port allows connection to a computer. The integrated digital/analog tuner lets you tune in any TV channels available over-the-air. The stand is detachable for wall mounting. The elegant design with glossy piano black bezel will enhance any decor. 1920 x 1080 native resolution for Full-HD (1080p) performance. Integrated ATSC TV tuner for HDTV broadcast reception. Wide Screen aspect ratio (16:9) for a complete home theater experience. HDMI input for true digital connection. Wide Screen aspect ratio (16:9) for a complete home theater experience. 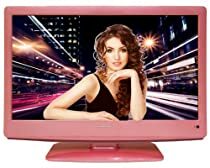 0 Response to "iSymphony LC24IF56PN 24-inch 1080p LCD TV - Pink"